Elizabethtown, Ky. December 5, 2016—The Elizabethtown Tourism and Convention Bureau gave their free smartphone app a facelift on December 5. The upgraded app, titled Tour Etown, is now manned by Bar-Z Adventures, the same mobile app company that provides the Kentucky Department of Travel and Tourism’s (K.D.T.T.) mobile application. Previously, Elizabethtown Tourism provided two free smartphone apps to residents and tourists. One supplied information about the Elizabethtown area, while the other gave self-guided tours of historic downtown. The upgraded app will encompass both area information and tours of downtown Elizabethtown. “I think users will have a better experience with the upgraded version of our mobile app. It’s easier to navigate and provides more information that we were not able to include in our previous app,” said Jessica Gowen, communications director of Elizabethtown Tourism and Convention Bureau. Users who currently have the app downloaded to their mobile devices will not have to re-download the app. Once Tour Etown is opened, a notification will pop up asking them to upgrade. Users who have downloaded Elizabethtown Historical Tours will no longer be able to access this app. They will need to download Tour Etown. 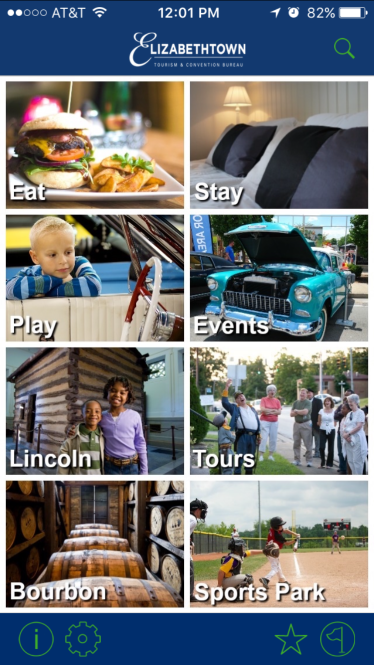 The Tour Etown app features attractions, lodging, restaurants, events, and more. New features include The Bourbon Trail, the Lincoln connection, and self-guided tours. Mobile users can also choose to receive important alerts involving Elizabethtown. The free app can be downloaded by searching “Elizabethtown” in Android’s Google Play store and Apple’s iTunes store.